In 2007, the Federación Canófila de Puerto Rico, headed by Mr Rafael de Santiago, the FCPR chairman, took on the challenge of organising the FCI Americas and the Caribbean Section’s three most important events for 2012 all at the same time. The Section’s General Assembly unanimously chose Puerto Rico as the venue for the 2012 FCI Americas and the Caribbean Section show, the 2012 General Assembly of the FCI Americas and the Caribbean Section and the 12th Congress for FCI Judges, Candidate Judges and Breeders, to be held for the very first time all together in a single country, preceded by three FCI international shows with the awarding of the CACIB. After two and a half years of hard work and overcoming the geographical and economic limitations of the time, the Puerto Rico Convention District became the American Canine District, welcoming hundreds of dogs from eighteen countries, delegates from sixteen FCI member countries and around 15,000 visitors over four days of canine activities. The 2012 FCI Americas and the Caribbean Section show was held in the Puerto Rico Convention District, one of the new tourist zones in the San Juan metropolitan area, which has hotels, parks, fountains and shops all clustered around the Puerto Rico Convention Centre, which is the largest in the whole of the Caribbean, as well as being the most technologically advanced in the whole of North and South America, and considered a jewel in the crown of modern architecture. It is just a short walk away from the Sheraton Puerto Rico, has 53,882 m2 of space in total, air conditioning, wireless Internet, restaurants and capacity for more than 10,000 people at any one time. Also located at the heart of the Convention District and a stone’s throw from the Puerto Rico Convention Centre, the Sheraton Puerto Rico was the official hotel for the 2012 FCI Americas and the Caribbean Section show. This is the most modern hotel not only in Puerto Rico but the whole of the Caribbean, with 500 rooms, a number of restaurants, an impressive casino, a lively nightlife and, best of all, dogs were allowed in the rooms at no extra cost to their owners. The week of 13th to 19th November was out-and-out dog week in the Puerto Rican capital. Wherever you went - on the beach, in the city and even in the Ciudad Antigua (the old part of the city) - everyone was talking about the fact that the world’s top dogs had arrived in San Juan. 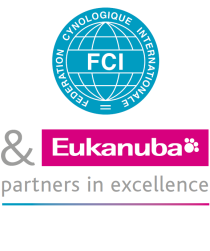 Wednesday 15th November saw the canine activities get underway with the 12th Congress for FCI Judges, Candidate Judges and Breeders. The FCPR organised the Congress for the third time, having enjoyed great success on previous occasions, and this time could be no exception. The Sheraton Puerto Rico’s Miramar Ballroom played host to more than seventy dog lovers and experts from all over North and South America, who met to listen closely to what the speakers had to say on a wide variety of very interesting topics, all of them of vital importance to the responsible training of judges. The FCI Americas and the Caribbean Section has been holding this important Congress every year since 2000. The venue for the first event was Mexico City and since then it has been held in a different city each year, with the aim of developing new judges, reinforcing the knowledge of current judges and providing valuable information for breeders from each of the Section’s countries. The Mayor of San Juan offered the FCPR the use of the Chapter House at City Hall as the venue for the 2012 General Assembly of the FCI Americas and the Caribbean Section. The historic building, which once housed the viceroyalty of Spain on the Island, provided a perfect setting for this important Meeting. Mr Miguel Ángel Martínez, Chairman of the FCI Americas and the Caribbean Section, chaired the meeting accompanied by Mr Rafael de Santiago, Chairman of the FCPR and the host of the Meeting. Sixteen of the Section’s twenty member countries attended with their respective delegates, and there were discussions on important dog-related subjects affecting both the Section and the FCI, along with plans for 2013. There were a total of 1,440 registrations over four days of competition, with 107 breeds taking part and different varieties, from eighteen different countries. These were superb figures for a world-class show which reminded a lot of people of the World Dog Show held in San Juan in 1997 and local dog lovers were thrilled at the sight of a number of breeds which had never before been seen in Puerto Rico, along with other highly popular breeds. The audience had the opportunity to see specimens from Russia, Lithuania, The Philippines, France, Germany and all over North and South America, and breeds such as the Transylvanian Hound, the Leonberger and the Xoloitzcuintle (Mexican hairless dog), all breeds which attracted the attention of the country’s news media. The facilities were suitable for an event on this scale, with comfortable, easily accessible rings, private campsites and a general campsite, commercial areas with all kinds of products and a spacious Ring of Honour with stands for the general public, where, during the day, there were demonstrations of agility, Schutzhunds, police and search and rescue dogs, amongst others. There was an additional ring in which the national obedience championship was held with a large variety of local and international entrants. The Mexican obedience team took the lion’s share of the prizes, having brought twelve competitors to the Championship. The Best in Show at the 2012 FCI Americas and the Caribbean Section show was judged by Mr Rafael de Santiago, the all round Judge and FCPR Chairman. With the ten best dogs in the competition standing in front of him, Mr De Santiago worked calmly, managing to maintain expectations with hundreds of people hanging on his every word waiting to find out which animal would be named the FCI Americas and the Caribbean Section’s top dog. Once the ten dogs had been judged, they were removed from the ring of honour, and tango music was heard around the venue, heralding the handover of the FCI Americas and the Caribbean Section flag to the next host, which is Argentina. Mr Roberto Vélez Picó, the FCPR Executive director and Mr Miguel Casellas-Gil, the FCPR’s Marketing director, handed over both the Section’s flag and the trophy commemorating the show to the Argentine delegation, which was made up of Mr Miguel Ángel Martínez and Dr Néstor Frascino from the Federación Cinológica Argentina, who will be hosting the 2013 FCI Americas and the Caribbean Section show. Once the formal ceremony was over, and to the beat of “We Are the Champions” by the British group Queen, the winners of the FCI’s ten groups paraded past one by one, with the audience cheering their favourites. One he had taken his decision, the judge made the announcements, starting with third place for Best in Show, which went to Ch. Mcvan’s Be Bop Baby, a Scottish Terrier owned by Vandra L. Huber & Rebecca Cross from the United States. Second place for Best in Show was awarded to Ch. Phillmar Sobe Monster, a Dobermann owned by Mary Klein, H & A Farías & P Martin from Florida. The Afghan Hound Ch. Fashionista of Damos, bred and owned by Mr Juan Miranda from Mexico City, was announced as the 2012 FCI Americas and the Caribbean Section show Best in Show, and the audience went wild, many of them invading the ring to take photographs of the supreme champion, the dog which will be representing the FCI Americas and the Caribbean Section at the Eukanuba World Challenge in Orlando this year. The 2012 FCI Americas and the Caribbean Section show would not have been possible without the support of Purina One, who have worked incredibly hard alongside the FCPR and supported the holding of this event in Puerto Rico from day one. The event was broadcast live via “thedogshowchannel.com”, “cinofilia-sud.com.ar” and “perrosenaccion.com”, with more than 40,000 hits for the live broadcasts plus those for the pre-recorded shows during the four days of broadcasting. The FCPR takes great pride in having raised the profile of the FCI and shown that the dog shows held by the FCI Americas and the Caribbean Section can rival the best in the world and, more than anything else, having once again put the name of Puerto Rico onto the canine world map.